8' Ultra Slim Flexible HDMI Cable For 4k, HD, and 3D Video. Flexible high-speed HDMI cable supports ethernet, 4K, UltraHD, 3D and hi-def audio return. A smaller more flexible head gives you the ability to bring high quality signals to tight spaces. This cable is fast. How does 1920x1080 resolution at 120 Hz sound? Like gibberish? Well the faster frame rate allows crisper HD videos to watch your favorite team, action hero, or take down the villain in your favorite video game. Our Super Slim HDMI cable is 50% slimmer than your standard HDMI cable, maximizing flexibility and maneuverability meaning this cable can go anywhere! (We prefer behind your slim TV, but we never judge). Size matters! With a 40% shorter cable connector head, you don't need to worry about seeing the cable poke out as much and works perfect for flat screen TV's and your laptop. Clean, clear connection with fast speeds because of our gold-plated connector. Because gold is a noble metal, it is very conductive in terms of signal strength and speed, therefore we are the HDMI cable royalty. Get it? 1080P? Yawn. Carry Ultra High Definition 4K video content to your 4K TV - Up to 4096x2160 at 30 Hz, or roughly four times your standard 1080p HDTV. 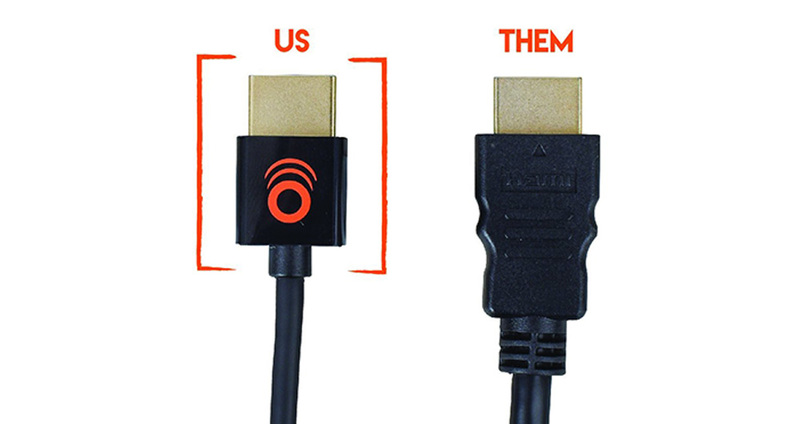 “Get this cable if you are tired of overbuilt HDMI cables. It works flawlessly obviously but what makes it stand out is the lighter connector.” -Sean S.
Click the button below to add the 8ft Ultra Slim Flexible HDMI Cable to your wish list.